Whats the font for the real game, and does it matter? Im just saying my font is most similair to minecraft just cause it looks like the font when youre typing on a sign. BUT i still want that font so i can start making my cards with it. It's the one I use in the generator. Usually size 20 for the title and size 10 for the description. Might be different for you cause' im using Gimp and i use a different text, but to find out whats right just experiment. Lol, i just got that. Goomba, i think from now on it should be compasses, Good job pointing that out. But either way i guess. The generator is on Page 2 at the bootom. There some links and pics there. Quick update, you can now save the file as a jpeg. Ignore the file window's message about malicious content, it doesn't actually have a file scanner, it's just warning you. Descriptions and actual game tomorrow. Forgot about the descriptions, didn't have any time to make anything yesterday, and I'm on a laptop without flash today, so I dunno when that will come in to play. what's the font you use for your descrption? So, how do you guys make these cards? I'd love to help :smile.gif:. EDIT: Why don't we use the "Dirt Block" spot to be a symbol for: Crafted with a 2x2 or a 3x3? I was gonna make a workbench card. EDIT2: I don't know how to get the template as a .png, that's the problem btw. Can you put that in the op, Goomba? People seem to keep missing it. Also, I'm doing descriptions today, along with the game. Yeah, it's the minecraft font. It just looks very different at small sizes (8 to 10-ish). Im still trying to find a minecraft font for gimp. Or should i keep it like my cards are and have the seed set icon instead of the dirt block showing its different? DECK: Consists of exactly 64 cards. You draw cards from here each turn. At the left side of the Battle Area. THE VOID: Below the deck, discarded cards go here. INVENTORY/HAND: Not an actual part of the play area since it's usually on your hand (hence the name), and your opponent mustn't see it. Here are the cards you can play in your Survival phase. It may only have up to 10 cards. BATTLE FRONT: At the top. Mob cards are played here. VILLAGE: In the middle. Structures are played here. THRONE: At the very bottom of the Battle Area. Your Player card and it's items go here. RESOURCE PILE: Below the battle area at the left. Your resources go here. ENVIROMENT: At the right of your resource pile. Location cards are played here. Each player starts the game with a deck of 64 cards. Each deck is shuffled by the opposite player, and each player draws 5 cards for their initial inventory. Then, each player looks for a Player card in their deck, and the first one found is put into play. The Player card is very important - if it's knocked out and there's no other Player cards to replace it in the player's Inventory, he loses the match. A player can also lose when his deck has no more cards. Who goes first is decided through a coin, rock-paper-scissors or another random method, and that player's turn starts. PLAYER FACE: Player card. This is the main card type - you defend your player while trying to eliminate the opponent's. BRICK: Structure. They have diverse functions, usually defending the player (those with the Shelter ability). They have a Resource cost. NOTHING: Resource. Those can be used to play Structure cards which require them - when doing so, you "tap" them by rotating it 90 degrees to the right. At your next Start Phase they're "untapped" (go back to normal). Resources can also be attached like items to Mob or Player cards that require them, for attacks or special abilities. IRON PICKAXE: Location. Some of them change gameplay through their effect, while others serve as a constant source of resources. When using a resource created by one of these cards, it's tapped. BONE: Mob. These are pretty similar to player cards, and can be used to damage your opponent's Player or other cards with health. They're played in the Battle Front. IRON CHESTPLATE: Item. Can be attached to a player, or a mob that specifically says it's able to use items, for it to use the item. CAKE: Special card. Usually an one-use card which is then discarded. GOLDEN APPLE: Expansion, or Mod card. They involve stuff that isn't in Mojang's original Minecraft game. START PHASE: The player draws a card, unless it's his/her first turn. If your Inventory has more than 10 cards, discard some until it has 10. (S)he may put a Resource from his/her Inventory in his/her Resource pile. 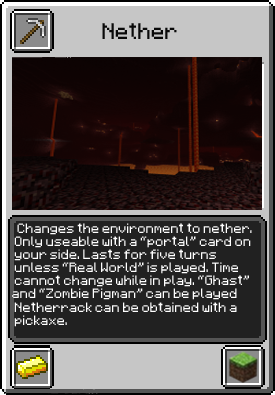 SURVIVAL PHASE: The player may play any other cards in this phase, such as Mob, Structure, Item and Location cards. BATTLE PHASE: The player may choose to attack the opponent by tapping Mob cards that will attack. The Player card itself may also attack, without tapping it. You may choose which Mobs or Structures to attack, but if you attack an Structure or the opponent's Player, the opponent may choose to block the attack with a Mob card, or an Structure with the Shelter ability if the Player is attacked. Tapped Mob cards can't block attacks to your Structures. END PHASE: Cards whose HP has reached 0 are discarded, and any effects that end in this phase do so. Then it's the other player's turn. Hey, good idea. Especially considering I called the discarding area after The Void. Yet another thought, why don't we make some of the cards on Apprentice or something (I'd like a more... Open program though, if you get what I mean), and test the game through it? Minecraft TCG , oh my god this is Genius!! !